The basic and most important component of Sea Turtle Lighting is Beachside Shielding. Beachside shielding is defined as a restriction of light trespass that specifically prevents and precludes any wasteful emission of light from a light fixture or property than shines onto, or in the direction of the beach, or adjacent waterlines. How Do I Shield My Existing Fixtures? The truth of the matter is that your existing light fixtures, may or may not be able to be shielded from the beach. This all depends on the style of fixture and design. If a light fixture mounted to the ceiling or wall emits light in every direction except the direction of the substrate or surface it is mounted to, then it is considered non-friendly, and energy wasteful. For instances where you can add either a metal or dark plastic cover on the beach side, and completely eliminate the light trespass, then your fixture can be shielded. This requires that from any vantage point on the beach, the light source can not be seen. *Be careful, as you might shield the light on a 5th floor of a building, and it looks shielded standing in front of it, it might actually be seen from the beach. Additionally, the fixture will require a Sea Turtle Approved Light Bulb. Wall Mount Fixtures such as the first fixture displayed here emit light in all directions. We have often seen properties attempt to spray paint the outside of the globe covering 60% of the surface in an attempt to shield the light. This does not work because the remaining portions of the globe surface shine directly onto the walls which is still highly visible from the beach. As well it leaves the property looking lack luster and ugly. Turtle Friendly Wall Mount Fixtures, shall emit light downwards (sometimes upward if completely hidden from beach) and not allow light to trespass horizontally from the fixture. As well these fixtures need to be paired with the preferable Amber LED Light Source at a wavelength of 560nm. 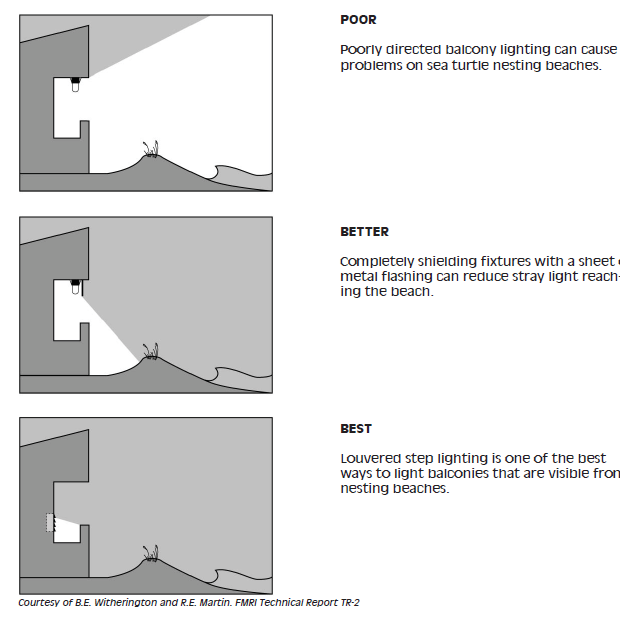 These fixtures are naturally beachside shielded, however caution should be used on higher level floors of buildings and may require additional louvers or hoods to prevent the light source within from being visible on the beach from an angle. For these instances, consult a Sea Turtle Lighting Professional to help select the correct fixtures for your multi-level building at 1-877-220-5483! Ceiling mount fixtures, though not as common on larger building structures are one of the most non-friendly for Sea Turtles. Unless the fixture is a Cylinder, or Square Downlight, you are surely not able to properly install or shield the fixture. these attempts are futile and may result in civil fines if not in compliance. Cylinder and Square type ceiling mount fixtures are mandatory replacements on buildings that face the beach and use ceiling lights. Because of the very difficult nature of these fixtures, black baffles are highly recommended to be installed within. On higher floors, deeper (taller) fixtures where the lamp is recessed up inside the fixture are preferred as the taller height of the fixture will ensure the lamp source is not visible. Some properties with low ceiling heights may not like these fixtures sticking down too far, so the shorter fixtures with baffles, and additional louvered inserts must be used. Where louver inserts are not available a lamp collar can be substituted. Fixtures that contain chrome or clear alzac reflectors do not meet this criteria and cannot be used. As a popular favorite of properties in Florida since early 1970, Loli-Pop, Acorn style yard lights and post-top fixtures often appear to a Sea turtle as a false moon. These types of fixtures often are found near the beach-line or around courtyards and pools, and lead to a lot of disorientation’s. Simply these type fixtures can not be shielded from the beach. Instead of futile attempts to maintain these types of fixtures, a simple replacement using a shielded bollard will not only meet the needs of Sea Turtle Lighting. Additionally, bollards are much more stylish and improve the quality of lighting design for a property. Bollards that emit light in one direction only, or louvered bollards with an internal beach side shield (aluminum insert) comply with beachside shielding requirements and give off plenty of light in the right direction. Avoid using external shields on these types of fixtures because they can often be pulled off by vandalism or require self tapping screws which can damage the fixture integrity. Landscape Lighting provides beautiful accentuations to a property and its landscape trees and plants. Unfortunately, there is no form of Up-Lighting that really meets the requirements of Sea Turtle Lighting. Shinning floods and spot up palm trees and shrubs just turns the tree into one big light source, and swaying branches and fronds make the light twinkle and simulate stars to Sea Turtles. During the Sea Turtle Season, these up-lights need to remain off, however pathway lights are perfectly suited when used with Amber LED. A property can maintain the safety and security of its residents and guests along pathways and stairs near beaches by using these types of fully shielded light fixtures. With changes in technology, adaptive amber LED Shielded Light Fixtures are now coming into the marketplace. Consult a Sea Turtle Lighting Professional for product recommendations based on your current property layouts. 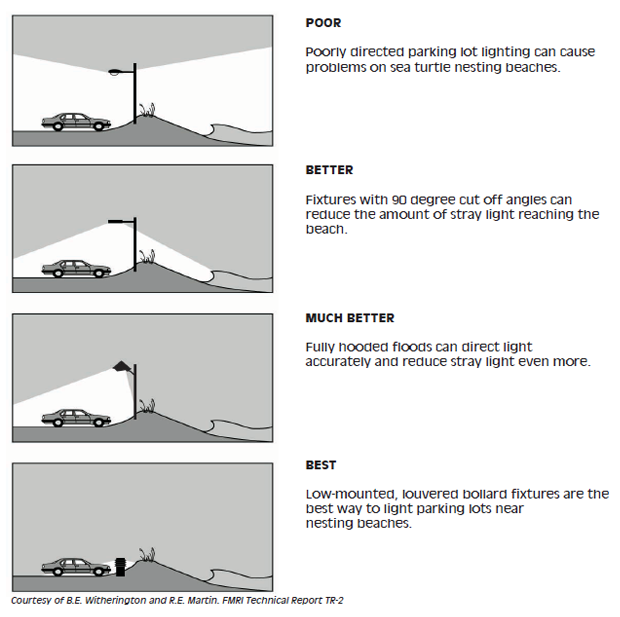 Poles must be lower than 12′ from the ground when using LED Parking Lot Lighting Fixtures and glare shields intact. A good form of change for parking lot lighting is LED bollards placed along the parking lot edges in front of vehicles. Though many property owners will voice concerns of the safety and security of residents and guests, the correct amount of fixtures will meet the basic safety requirements necessary for liability.